Validated parking at Parcels Seven parking garage is available, located on Congress Street by Fanueil Hall. Private dinning room for party of all sizes overlooking Paul Revere House in historic North Square. 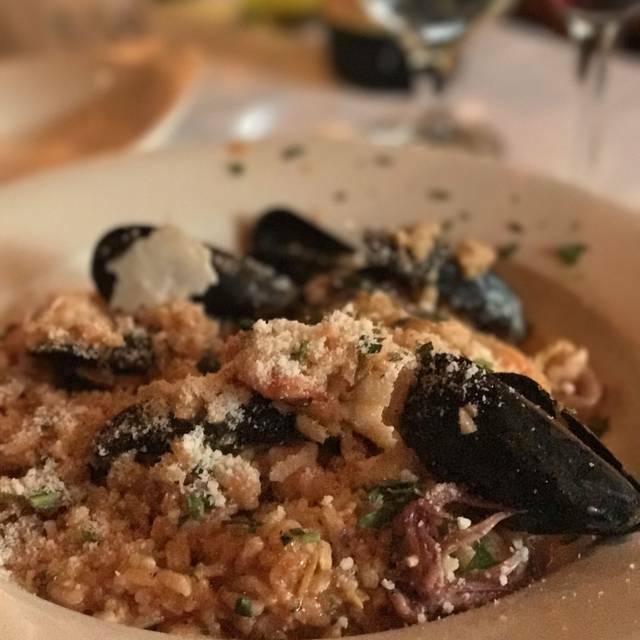 Riccardo's Ristorante is located in the North End neighborhood of Boston and is a family run business which has been recognized by local and national known food critiques as one of the best authentic Italian Restaurants in Boston. Now being run by Richie Jr., Riccardo's has the same fine standards and quality of food as always. The staff is highly trained and knowledgeable about every item on the menu. Unlike other Italian restaurants in the neighborhood Ricardo's never skimps on portions. Come and visit. Renew your love for Riccardo's. Despite the madness from the Marathon Monday crowd, we still received excellent service and food! I don’t know what was better... the food or the service! Very friendly family and we had a great time interacting with the staff! The were so hospitable! The food was literally the best Italian food I’ve ever had! Highly recommend it!!! We had a wonderful meal, food was delicious. Our waitress was wonderful, and although it was Marathon weekend and extremely busy, we didn't feel rushed at all. The food was delicious but just simple fare. Gnocchi good, service obnoxious. Order wine only. Went to Riccardo's two weeks ago with my wife - it was so good we went back with friends last weekend. Menu provides many alternatives and all of our meals have been great. Traditional and authentic Italian meals at very reasonable prices. We eat out in the North End quite frequently and Riccardo's stands out as one of the best options. I love this restaurant! My favorite in the north end! I always take my family and friends here. Great food/people/environment! Authentic North End experience. Have been coming here for years and it is my favorite restaurant in the North End. The food is delicious and I have high standards! I would eat their red sauce with a spoon. Yummm. Took a group of ladies here to have a nice dinner for a Bachelorette party. It was exactly what the Bride was looking for. A wonderful Italian dinner. The food, service and atmosphere was fantastic! The food was great I got the lobster ravioli and clam and mussel appetizer. Service was good and they gave complimentary limoncello at the end of the meal. It was very loud in there hard to have a conversation. Once people cleared out towards the end of the night it got much more enjoyable. Overall a good experience and I would go again. We had a large group and we were able to make a reservation for nine people in the upstairs room at prime time on a Saturday night. We were seated right away. The food was good and everyone seemed to enjoy their dinner. We had meatballs for one of our appetizers and they were outstanding. The restaurant was off the beaten track and was a great place for us to gather and celebrate. Saturday was National Pizza Day....and boy did we celebrate with the best tomato mozzarella pizza ever!! the tomatoes and cheese were so fresh...they also added avocado, yum! we topped it with a delicious Provence Rose...perfecto! I found Riccardo's on Open Table and booked a reservation based on the reviews I read. In town for a concert and looking for a great place in the North End prior to the show. Riccardo's was fantastic! Seated right on time...the service was excellent even with the place hopping on a Saturday night! 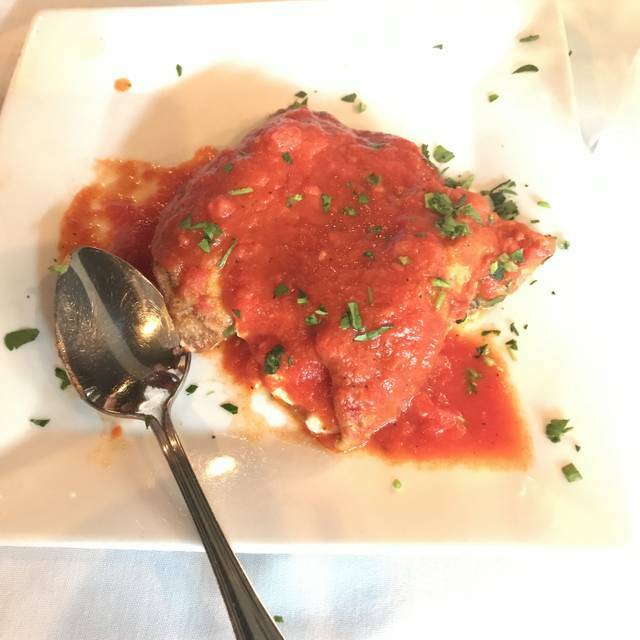 I ordered eggplant parm based on all the great reviews and I have to say it is the best eggplant I have ever eaten in a restaurant. I make my own at home so I'm pretty picky and usually don't order it out. Large portions and my husband had the Veal special that night and that was great too! Our son was with us and had the Fettuccine Alfredo which was awesome too! The menu has a little something for everyone and the prices are reasonable for the area. Will be taking a trip back to the North End just to eat at Riccardo's again! Great food and drinks, and great prices for this area. Our new favorite North End spot! Family run place (aren't they all) but we really felt welcome here. Plus is bigger than most North End places, so it's good for a larger group too! Food was excellent and Orlando's wine recommendation was far better than our plan. We'll be back often! I love this restaurant. My boyfriend and I wanted to try somewhere new, and we found this place. The service was fantastic, the staff was so friendly and the food was AMAZING!! I absolutely recommend a visit for some fantastic Italian food! Excelent food and place to have dinner pr lunch. The service was fast! Got a recommendation for local business owner and we loved the place. Real authentic Italian feel and the food was delicious. Staff was quite funny and very nice. Great place to go in North End! Excellent food and the service was great and comfortable. Highly recommend Ricardo. Always good food and good service. Will go back again. We had a large group of people. The staff was very cooperative but we felt rushed at times. At other times, we felt that the service was being pushy towards certain dining options, such as picking a predetermined plate of appetizers. Also, when we asked about the wine list, we were talked down upon as if we didn’t know what we were talking about it. Excellent food and service! We could not have been happier. We arrived promptly at 6:30 pm for our 6:30 pm reservation for four people. While waiting, I watched as larger groups that had later reservations get seated ahead of us (tables pushed together to accommodate them). After about a half hour, one of the people doing the seating told us that they were waiting for people to leave. 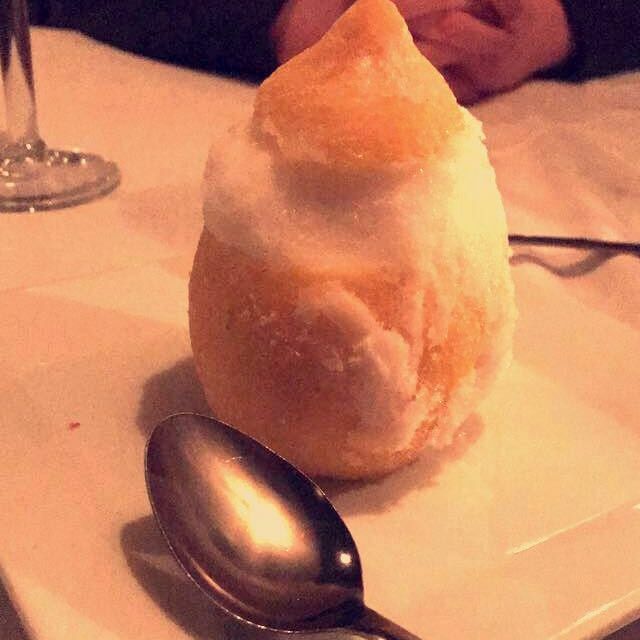 He explained they had dessert, paid their bill, but weren't leaving. In the meantime, I was starving. I don't know why he couldn't gently nudge them along, but he didn't. At that point, we decided to sit at the bar which defeated the purpose of having dinner with my adult sons who I don't see all the time. I was at one end and could not even talk with them. I had to ask for bread which was mediocre. Our food arrived at 7:30 pm. My dish was salmon alla griglia served with broccoli. I had to ask for a side of pasta and sauce which was so hot, it burnt my mouth. At the end of the meal, the side of pasta with stewed tomato sauce was $8 - for a very small dish. Most good places that inconvenience you will usually throw in something for free - not this one. I wondered why this restaurant is on Open Table if there really wasn't an Open Table to be found. This was VERY DISAPPOINTING. There are many restaurants in the North End. I will NOT be returning to this one. This restaurant was amazing!!! We had a party of 11 which included 5 children. The waiter was attentive to not only the adult table, but he paid special attention to the kiddos sitting at their own table as well . The food was delicious! I highly recommend the stuffed veal chop!! Great service, great ambiance and really great food!!!! At frist the hosts sat me were I was uncomfortable with the noise of a big party but in-matter of seconds I was given a table were I felt an intimate atmosphere, without even asking. Food and service were outstanding! Our server was helpful and new his job. He had a good attitude. Great job!! Please thank them all. As always Riccardo's was a wonderful place to hold our annual cousins get together. They are one of the few places in the North who can accommodate a large party and the food is fantastic! This meal was incredible!! Everyone’s sauce was an absolute delight. This place can really cook eggplant; best I’ve had in Boston. I ordered the linguine with clam sauce and they were REAL clams. Phenomenal. The service was super friendly and just the right level of attention. Can’t wait to come back! Very enjoyable! Great friendly service! Before show meal with reservations. Seated promptly, attentive service, great food! Bruschetta was delightful! My husband loved chicken dish as I thoroughly enjoyed risotto with fruitti de mare.Didn’t feel rushed as some restaurants do to turn over table. Great Italian food, off the tourist path (this is good!). If you want great food in the North End, come here. Orlando was our server for a party of 18. He made it easy for us by recommending wine, which was fabulous! His recommendation of family-style appetizers worked out perfectly and were delicious. The ambience was ideal for a birthday celebration. This is my second time there in less than a week and both times the food was delicious, the service was exceptional and the ambiance was that of a quaint, family restaurant yet with fine food cooking. This was our first time at Riccardo's and it was great. Not crowded which was a huge surprise. Nervous to recommend since we like quiet places, but we will. The carbonara was as good as I have had. A real North End gem. We had a reservation for 8. We were seated promptly, service was excellent, kitchen was very accommodating, and food was delicious! Will definitely return!